Here is the list of the hotels near Urmatt. Book your hotel near Urmatt today, Friday 10 May for the best price, reservation and cancellation free of charge thanks to our partner Booking.com, leader in on-line hotels reservation. Below here is the list the 50 closest hotels of Urmatt, sortable according your criteria. You will find the position of these accommodations on the Urmatt hotels map. Hotel L’Ami Fritz is located at the foot of Mount St Odile in Alsace and housed in an 18th century stone building. The hotel offers free WiFi access and a free parking. Guest rooms at L’Ami Fritz are fitted with a flat-screen TV and a private bathroom with a bath or a shower. The hotel’s restaurants, the ‘Winstub’ and ‘Kamistub’ offer fresh, regional cuisine in a warm atmosphere. A buffet breakfast is served daily. During the summer months guests can dine on the shaded terrace. A sauna and a hammam are available in La Maison de Sophie, located 20 metres away. Situated in Ottrott, Appartments Rue Des Châteaux provides accommodation with a flat-screen TV. Complimentary WiFi is available. All units include a fully equipped kitchen, allowing guests to prepare their own meals. A microwave, a fridge and stovetop are also provided, as well as a coffee machine. Skiing and hiking can be enjoyed nearby, while ski storage space is also available on site. Mont Sainte Odile is 11 km from the apartment. The nearest airport is Strasbourg International Airport, 30 km from the property. Apartment Ottrott Preferred hotel ! Offering free WiFi and city views, Studio Gite Fischer Ottrott is an accommodation located in Ottrott. The apartment is 11 km from Mont Sainte Odile. The apartment consists of 1 separate bedroom, 1 bathroom with free toiletries and a hair dryer, and a seating area. The kitchen is fitted with an oven, a microwave and a toaster, as well as coffee machine. The nearest airport is Strasbourg International Airport, 30 km from the property. Located in Ottrott, Gîte Fischer is 450 metres from the Tourism Office. This half-timbered house includes 5 individually decorated bedrooms and a living room with a flat-screen TV and a PS2 game console. A DVD player and a CD player are also provided at Gîte Fisher. The bathroom is complete with a multi-jet shower and a hairdryer. The kitchen is equipped with kitchenware, a dishwasher and a stove. A fridge, a coffee machine and an oven are also provided. There is a TV in the dining area. Activities in the area include hiking and cycling. A washing machine is at guests’ disposal and free public parking is available on site. Featuring free WiFi throughout the property, Location Alice is a holiday home set in Ottrott, 3.1 km from Mont Sainte Odile. It provides free private parking. A dishwasher, an oven and a microwave can be found in the kitchen. Towels and bed linen are offered in this self-catering accommodation. Other facilities at Location Alice include a barbecue. Free use of bicycles (4 bikes for adults and 1 bike for a child) is available at the property and the area is popular for cycling. The nearest airport is Strasbourg International Airport, 17 km from Location Alice. Located in Ottrott in the Alsace region, Gîte sainte Famille features a terrace and mountain views. Guests have access to free WiFi. The villa has 3 bedrooms, a flat-screen TV with satellite channels, an equipped kitchen with a dishwasher and an oven, and 2 bathrooms with a shower. The villa offers a barbecue. Guests at Gîte sainte Famille can enjoy skiing nearby, or make the most of the garden. Mont Sainte Odile is 11 km from the accommodation. Strasbourg International Airport is 30 km away. 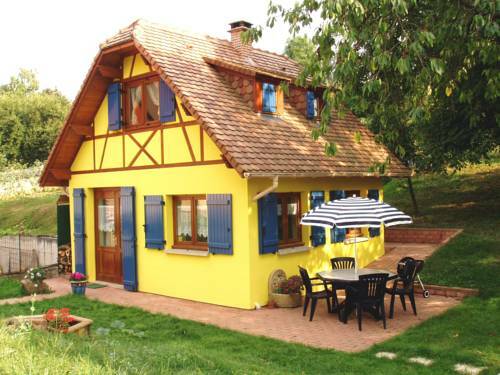 Featuring free WiFi throughout the property, Chambres d'Hôtes Chez Mado OBERNAI offers pet-friendly accommodation in Obernai, 27 km from Strasbourg. Free private parking is available on site. You will find a coffee machine in some rooms. Every room includes a private bathroom. You will find a shared kitchen at the property. Colmar is 43 km from Chambres d'Hôtes Chez Mado OBERNAI, while Riquewihr is 34 km from the property. The nearest airport is Strasbourg International Airport, 17 km from Chambres d'Hôtes Chez Mado OBERNAI. Below here is the hotels map of Urmatt. Names and details of Urmatt hotels can be shown on the map clicking on the prices icons.